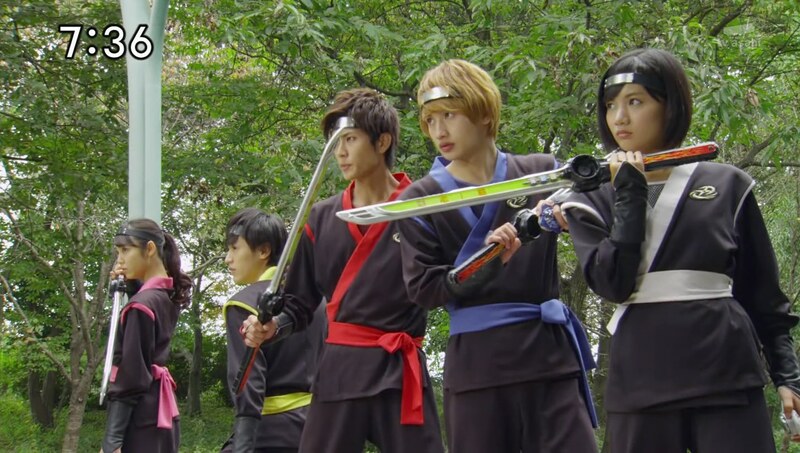 Recap: Shuriken Sentai Ninninger, Episode 39 – Kibaoni's Son Mangetsu Appears! A Youkai is terrorizing kids on his “snack hunt,” stealing all their snacks for the day. The Ninningers confront the Youkai as he is being carried by Hyakkarage. Once Takaharu tells the guy who they are, he appears to be very scared to the point that he falls off the Hyakkarage. Ariake no Kata appears and makes sure the Youkai is alright. Masakage appears and they introduce who this guy is. Turns out this guy is Kibaoni Mangetsu, Ariake no Kata and Kibaoni’s newborn son! Mangetsu will make them pay for their mocking him and tells the Hyakkarage to stay back. He’ll do this himself. He charges forward as the Ninningers henge. Takaharu takes the first slash. And Mangetsu immediately falls to the ground. He crawls backwards. Masakage orders the Hyakkarage to protect the young master as Ariake no Kata and Masakage whisk Mangetsu to safety. Mangetsu scolds Masakage for not coming to his rescue sooner. Masakage tries to explain that Mangetsu specifically told them to stay back, but Mangetsu denies it. He tells Masakage to consider his words on the same level as his father’s. Mangetsu then takes a seat to enjoy the snacks he stole from the children. Back at the dojomanse, the cousins fill Kinji in on what happened. They laugh at how much of a dummy this Mangetsu seemed to be and how easy it will be to take him down. But Kasumi says they should remember their ninja creed: A ninja must never fear, worry or underestimate. So they definitely need a proper plan to destroy Mangetsu for sure. And Kasumi has just the plan: The Grand Tea Party Operation. Kasumi explains. Grandpa watches from behind the wall and says she’s still got a ways to go. The plan begins by Kasumi and Fuuka pretending to have a tea party to lure Mangetsu for his snack hunt. They henge and just as expected, Mangetsu orders the Hyakkarage to fight them instead. That’s when the guys will pop out of the ground. And that should leave Kasumi and Fuuka free to take care of the scaredy cat Mangetsu. Everything’s going according to plan so far. Kasumi has wrapped vines around Mangetsu. But he suddenly lets out a deep, evil laugh which takes the girls by surprise. Mangetsu easily breaks free of the vines and speeds through with a quick slash at Kasumi and Fuuka. He then proceeds with bigger attacks and focuses on a brutal beating of Fuuka while explaining he has been watching from inside his mom’s body. So he knows exactly how to fool them and has been playing dumb this entire time. Mangetsu’s plan was to trap them and gather their fear. Kasumi is frozen in shock and in tears as she watches Fuuka being absolutely brutalized before she is forced to dehenge. Kasumi runs over to her cousin and covers her. But the fear in Kasumi is evident and it gets collected in the gourd. Mangetsu deliciously drinks it. The guys arrive before Mangetsu can deliver a final blow. He blasts them to the ground and mocks the Last Ninja. 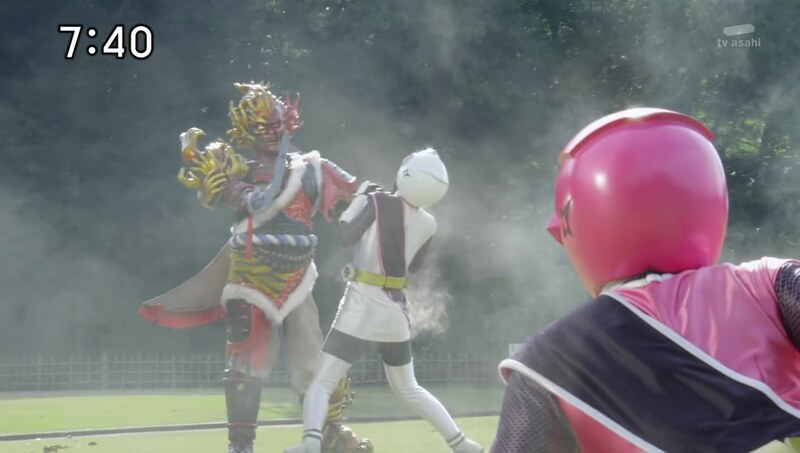 Takaharu goes Chozetsu, but Mangetsu just swats their attack away. Kinji suggests they retreat for now and he whisks them back home. That night, Mangetsu drinks more fear as Masakage apologizes for his earlier rudeness. Mangetsu vows to gather enough fear to revive his father. Grandpa approaches Kasumi in the living room. She says her naiveté put Fuuka in danger. Despite her reminding others about the ninja creed, she herself went against it. She underestimated the enemy and gave in to her fear. Grandpa says that just shows she’s still growing. The others listen as Grandpa reminds her that even the most skilled ninjas can easily underestimate, fear and worry. That’s why a ninja never stops learning and training. Grandpa poofs away as the cousins enter the living room. Fuuka tells Kasumi not to worry as she’s fine. But Kasumi bows and apologizes to her anyway. The cousins try comforting Kasumi and tell her just how important she’s been to them. They tell Kasumi their faith in her will never change. Next day, Mangetsu attacks Toei Stadium to draw out the Ninningers. But only Kasumi comes running. She demands Mangetsu face her instead of terrorizing innocent people. But he asks if she can beat him on her own. Kasumi says even if may not be able to, a ninja must erase her dishonor by herself. She charges toward Mangetsu who again tells the Hyakkarage to stand back. Kasumi gives Mangetsu everything she’s got, but he manages to knock her around. Kasumi sees her cousins and thinks about the plan Kinji presented. Kasumi would act as bait to let Mangetsu’s guard down. Fuuka thought that was dangerous, but Kinji says since Mangetsu’s goal is to collect ninja fear, he won’t finish Kasumi off right away. When Mangetsu is open, Takaharu and Kinji will attack. Fuuka was still not sure about the plan, but Kasumi says she trusts them. Fuuka says she’ll provide support to Takaharu and Kinji then. And so far, everything’s going according to plan. 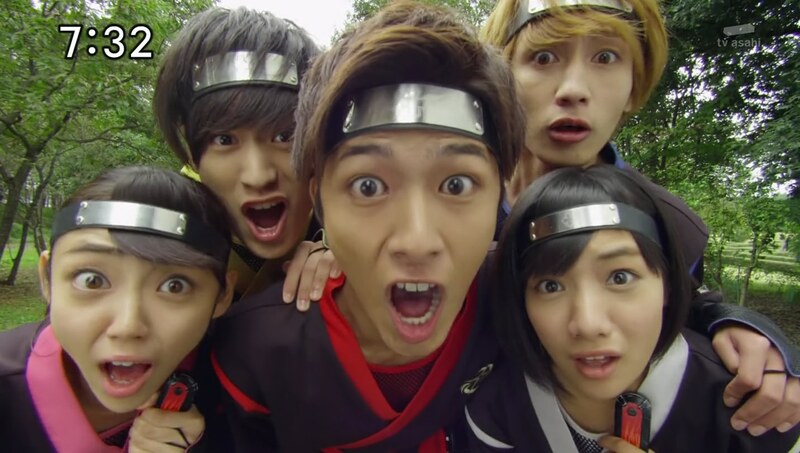 Takaharu, Kinji, Fuuka and Kasumi disappear. Mangetsu tells the Hyakkarage to find the Ninningers. But two Hyakkarage attack Mangetsu from behind. Yakumo used magic to make him and Nagi Hyakkarage. They duck out of the way as Mangetsu destroys all the other Hyakkarage guarding him. Kasumi reappears with the others. Kasumi henges and the cousins work together to take on Mangetsu. 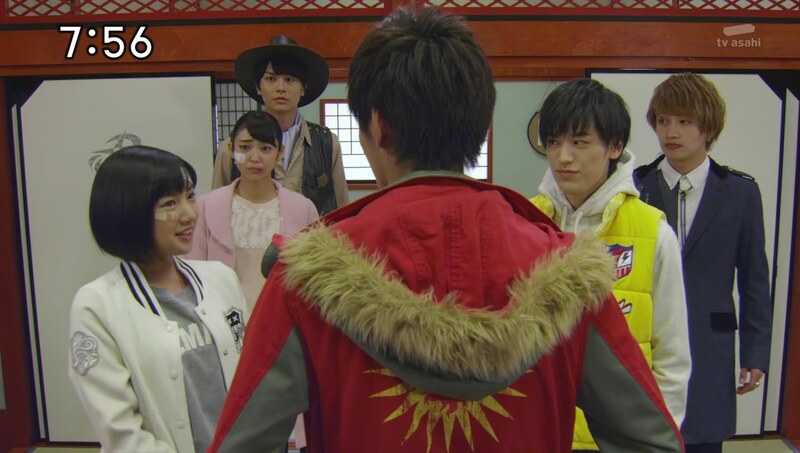 Takaharu decides to go Chozetsu, but Kasumi asks to borrow it. Shishi-Oh is excited to attach to Kasumi, but she says no since he clashes with her fashion sense. 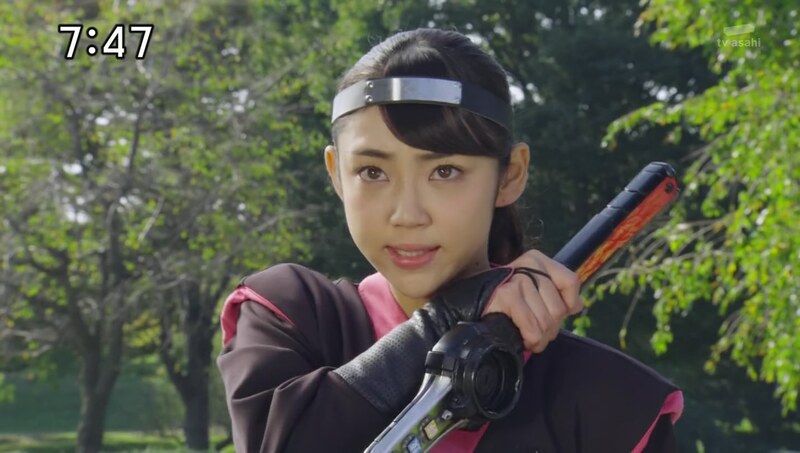 Instead, she will borrow his power as well as Kinji’s Gekiatsuto. Kasumi charges toward Mangetsu and delivers Transcendental Hot Wild Slashes. That knocks Mangetsu over and the cousins work together to deliver a big Ninja Slash. That appears to finish off Mangetsu’s first life, but he decides to embiggen himself. The Ninningers hop into Gekiatsu Dai-Oh. But Kasumi’s missing? 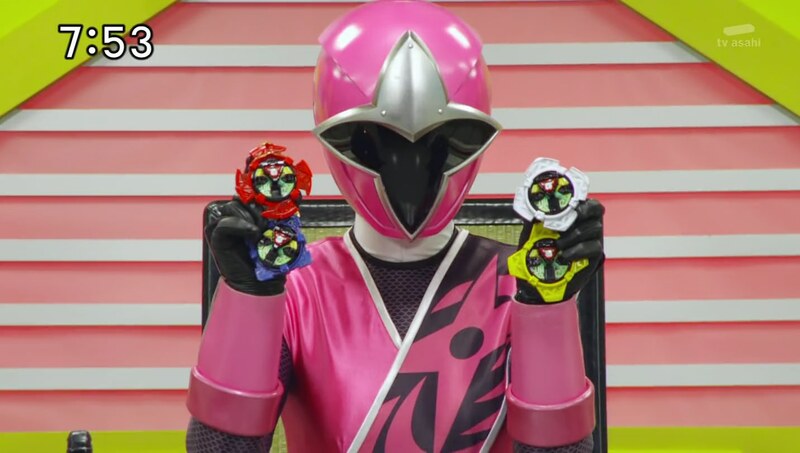 Kasumi stealthily borrowed their Otomo Nin Shurikens and hopped into ShurikenJin instead. Suddenly, four Gashadokuro appear, sent by Ariake no Kata to allow her beloved son to escape. Mangetsu does not appreciate his mother’s actions at all, but he decides to leave anyway while vowing to pay the Ninningers back later. Kasumi tries to catch Mangetsu before he goes, but the four Gashadokuro block her. Fine then. With a little help from the others, Kasumi uses Paonmaru, UFOmaru and Surfermaru to lay waste to the four Gashadokuro herself. They head back home, relieved that their plan was a success. But they know now that Mangetsu is truly strong and they will need to prepare even more for next time. Takaharu says it’s alright. He’s sure they’ll come up with something. The cousins laugh at Takaharu’s go-go-go spirit. But something’s still off with Kasumi. Kasumi is awesome. Period. Dot. The End. Her focus episodes have always been great, many times some of the best of the season. And this one was no exception. It developed very well and in a shocking way too. I wasn’t sure the scenes of the tea party and the Ninningers fighting Mangetsu were actually happening or just Kasumi still describing her plan. I thought Fuuka being brutally beaten (that was insane!) was just Kasumi seeing the fault in her plan. But no, it was actually happening! Damn, that was a big shock for me. Very unexpected, but that’s what made those scenes particularly excellent. 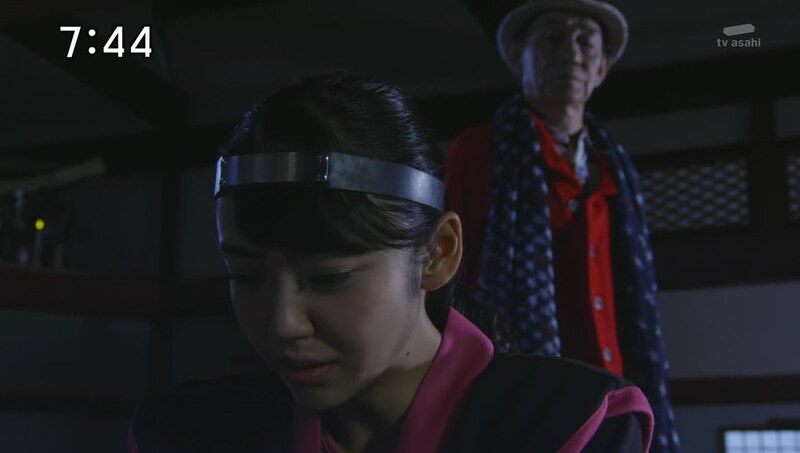 Seeing Kasumi actually cry and be so down about not only being wrong, but putting her younger cousin in danger was one of the best character moments I’ve seen on any toku, Japanese or American, in a long time. It was very strong and the contrast from Ninninger‘s overall lightheartedness emphasized how powerful those scenes were. Mangetsu just pretending to be a bakatono shouldn’t be a big surprise. He appears not to respect his mother at all and of course not Masakage either. That’s a very interesting personality to watch play out especially if the big Kibaoni pops up. But the obvious twist in Mangetsu’s playing dumb merely helped propel the story around the cousins. Kasumi has arguably been the most skilled, mentally and physically, of the Ninningers and in best position to be Last Ninja. I’ve definitely been rooting for her the most. And that little look of worry or hesitation to close the episode looks very interesting. It’s good to see character stories carry over past a single episode. But when are we going to address Kinji’s similar episode-closing expression too? Back to the beatdown of Fuuka. Damn, that really was brutal. 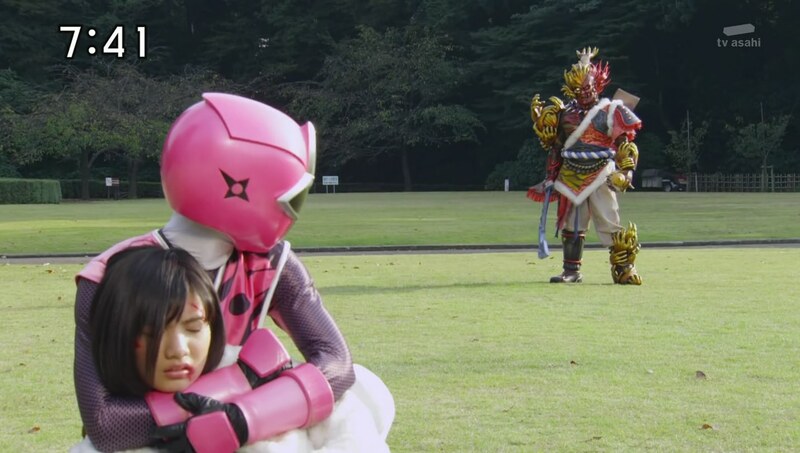 I don’t remember what episode it was (or maybe it was ToQger with Mio or Kagura) where Fuuka was again brutally beaten by a monster. So horrible! I felt for her. On the flipside, Kasumi facing Mangetsu on her own was so awesome. It was great seeing her hold her own and give it everything she’s got. While I kinda wish she was able to fight Mangetsu without the others coming in to help, that aspect however continues the reinforcement of the Ninningers’ bond. And again, establishing a strong bond within a team like this helps with the overall story and the viewer’s connection with the heroes. In other fun things about the episode, Kasumi and Fuuka looked great with those wigs. Fuuka especially was very pretty with long hair. 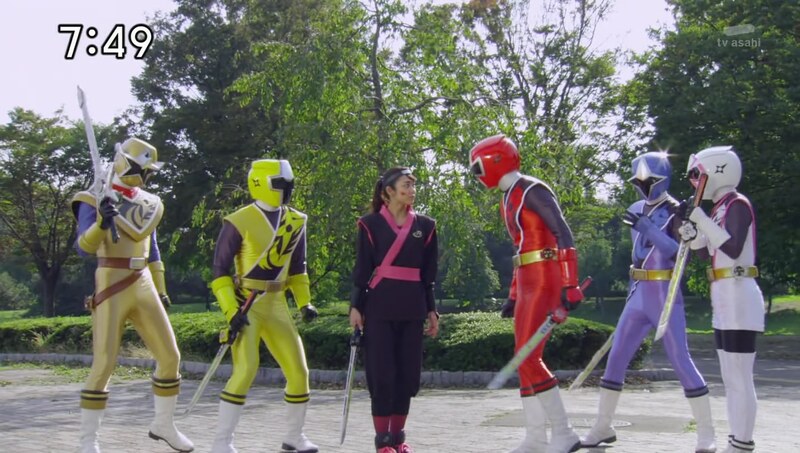 Overall, one of my favorite episodes I think of Ninninger. These are the kinds of episodes I want to see as we head into the home stretch of the season. 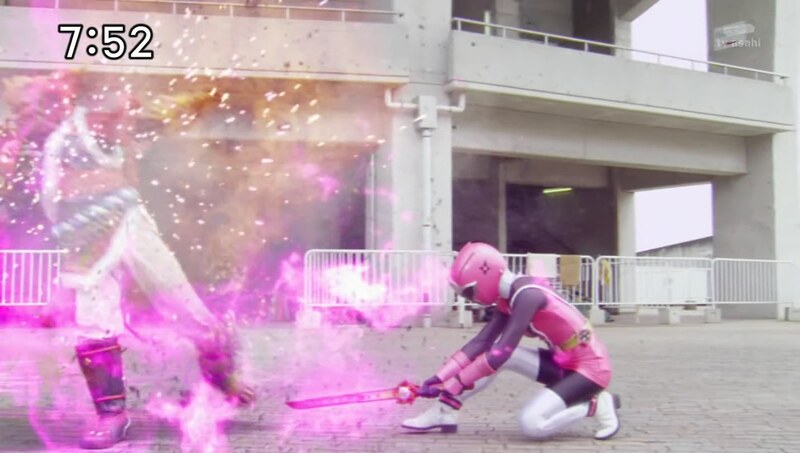 ← Recap: Power Rangers Dino Charge, Episode 19 – "Finding a hero is harder than I thought."